From urban roadways that celebrate the communities around them to stunning modern structures, the Federal Highway Administration's (FHWA) Excellence in Highway Design Awards Program recognizes the best in today's roadway design. The 2006 award winners improve safety, project management, and mobility while creatively enhancing their surrounding environment. The 2006 awards for Excellence, Merit, and Honorable Mention in 11 categories were announced at the American Association of State Highway and Transportation Officials' Annual Meeting in Portland, Oregon, on October 28. The individual awards will be presented to the winners at later dates by their local FHWA Division Administrator. For more information on the awards program, contact Program Coordinator Donald R. Jackson at FHWA, 202-366-4630 (email: donald.jackson@fhwa.dot.gov), or visit www.fhwa.dot.gov/eihd/2006/index.cfm. Octavia Boulevard, San Francisco, CA. Damaged during the 1989 Loma Prieta earthquake, San Francisco's double deck Central Freeway has been replaced with an attractive tree-lined boulevard that not only carries auto traffic efficiently, but is neighborhood, bike, and pedestrian friendly. 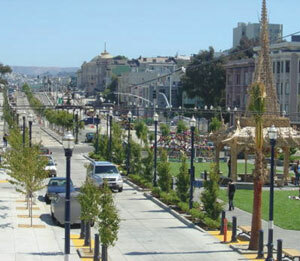 Completed in 2005, Octavia Boulevard has revitalized the neighborhood and reunited two areas of the city. Contact: Frank Lee, San Francisco Department of Public Works, 415-437-7018 (email: frank.w.lee@sfdpw.org). The reconstruction of Trunk Highway 38 has improved safety and efficiency and preserved the route's many natural, scenic, and recreational resources. Accidents have been reduced more than 55 percent, while the flexible design has remained sensitive to the multiple users of the roads. Contact: Brian Larson, Mn/DOT, 218-723-4820, ext. 3322 (email: brian.larson@dot.state.mn.us). 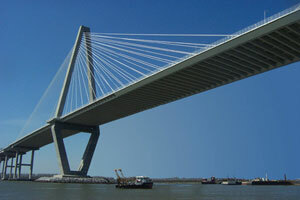 The new $640 million Ravenel Bridge over the Cooper River in Charlestonis North America's longest cable stay span bridge. Completed a year ahead of schedule, the striking bridge features a diamond shaped tower design that was selected by the public. Its innovative structural engineering solutions were matched by an emphasis on environmental stewardship, including special protection of the habitats of Loggerhead Sea Turtles. Contact: Charles Dwyer, SCDOT, 843-534-5000 (email: dwyerct@dot.state.sc.us). North Torrey Pines Road Bridge, San Diego, CA. 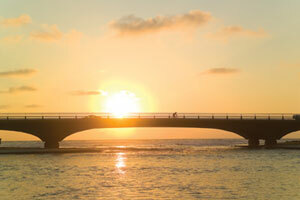 Located at the Torrey Pines State Beach , the North Torrey Pines Road Bridge crosses a coastal lagoon. The new structure provides the region with a state-of-the-art bridge and an architecturally significant landmark whose flowing appearance integrates with the lagoon and ocean setting. Contact: Kris Shackelford, City of San Diego, 619-533-3781 (email: kshackelford@sandiego.gov). During reconstruction of the heavily traveled US 84/285 corridor in New Mexico, the project team worked to find innovative ways to decrease the impact of construction on the environment and to preserve and protect valuable natural resources, including mature Pinon pine trees. Other steps taken to enhance the aesthetics of the corridor include the installation of interchange artwork designed by local artists. Contact: Rosanne Ruiz, NMDOT, 505-476-4205 (email: rosanne.ruiz@state.nm.us). Completed in 1930, the Cotter Bridge on U.S. Highway 62B over the White River is an excellent example of the Marsh Rainbow Arch construction technique. 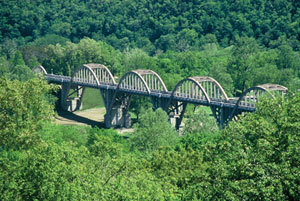 After 70 years of continuous use, however, the bridge needed major repairs. Through such measures as requiring that concrete work replicate the original design of the bridge, AHTD was able to preserve the historic integrity of the structure while improving safety. Contact: Ellen Hill, AHTD, 501-569-2571 (email: ellen.hill@arkansashighways.com). Allegany River Rest Area, NY. This rest area facility near the Allegany Indian Reservation reflects a contemporary interpretation of a woodland theme characteristic of the Native American culture of the region. 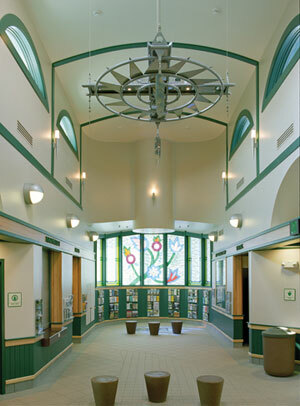 The building's lobby recreates the traditional woodland central gathering area, including mosiac tile, a fire pit, and seating stones. 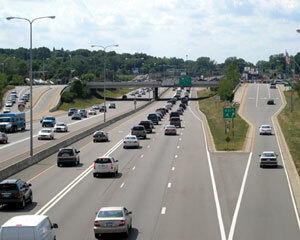 Contact: Dwight Mateer, NYSDOT, 716-847-3757 (email: dmateer@dot.state.ny.us). To alleviate congestion and delays on the I-394 corridor in Minneapolis, Mn/DOT converted underutilized high occupancy vehicle lanes to high occupancy toll (HOT) lanes. It is the first HOT lane project to use open-road tolling on a road where there is no barrier separating the HOT lanes from the general purpose traffic lanes. Contact: John Doan, Mn/DOT, 651-634-5309 (email: john.doan@dot.state.mn.us). J. Douglas Galyon Depot, Greensboro, NC. Built in 1927 as a Southern Railway train terminal, the J. Douglas Galyon Depot has been renovated to serve as a multi-modal transportation complex. Now called the Greensboro Multi-Modal Transportation Center, the depot serves the city as its central ground transportation hub. Contact: Eric Haugaard, North Carolina Department of Transportation (NCDOT) Rail Division, 919-733-7245, ext. 253 (email: ehaugaard@dot.state.nc.us). Grand Loop Road, Yellowstone National Park. Constructed in the 1920s and 1930s, the Grand Loop Road is the primary public access to much of Yellowstone National Park. 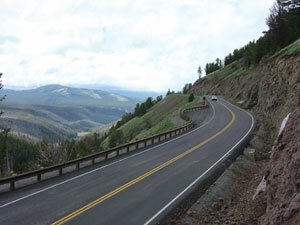 Reconstruction of the Canyon to Tower segment of the road improved the roadway to current Park Road Standards while protecting the historic and natural resources that define its character. Contact: Grant Lindsey, FHWA Western Federal Lands Highway Division, 360-619-7588 (email: grant.lindsey@fhwa.dot.gov). MassHighway's new Project Development and Design Guide is the result of a diverse 28-member Task Force that worked together to reflect the viewpoint of all transportation stakeholders, resulting in guidelines that encompass Nationwide best practices. Contact: Luisa Paiewonsky, MassHighway 617-973-7800 (email: Luisa.Paiewonsky@state.ma.us). The Beartooth Highway begins at the northeast entrance to Yellowstone National Park and links the communities of Cooke City and Red Lodge, Montana. 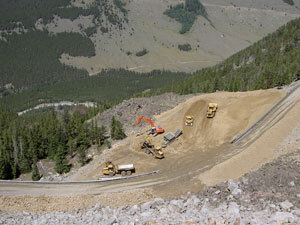 After major mud and debris slides severely damaged the road in May 2005, a unique design-build approach and significant partnering efforts resulted in the road being reopened in less than 5 months. Contact: Lori Ryan, MDT, 406-444-6821 (email: lryan@mt.gov). The replacement of San Francisco's Central Freeway, which was badly damaged in the 1989 Loma Prieta earthquake, included construction of Octavia Boulevard and a new ramp connecting the Freeway to the Boulevard. Working with the City of San Francisco and a Citizens Advisory Committee, Caltrans built a less imposing, single deck steel structure that complements the surrounding urban environment. Contact: Nidal Tuqan, Caltrans, 510-286-5542 (email: nidal_tuqan@dot.ca.gov). 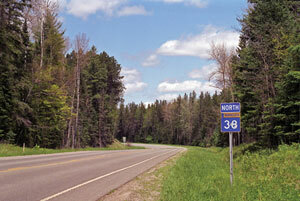 Mn/DOT reconstructed and expanded an 18.5-km (11.5-mi) section of Trunk Highway 23. The project included building an extensive storm water management system and reconstructing part of the Glacial Lakes State Recreational Trail. Collaboration with local communities was crucial to the project's success. Contact: David Larson, Mn/DOT, 651-284-3774 (email: david.larson@dot.state.mn.us). In its first design-build project for a major urban arterial, UDOT widened and reconstructed 9.6 km (6 mi) of roadway through the cities of Draper and Riverton and 1.6 km (1 mi) of I-15. Using context sensitive solutions, the project team built a safe and efficient roadway that is also compatible with the community's history, culture, and natural environment. Contact: Scott Lucas, H.W. Lochner, 801-262-8700 (email: slucas@hwlochner.com). This public-private venture was built on a collective vision of better serving the public. The welcome center's rustic style architecture serves as a new gateway to the Brainerd Lakes Area, while the accompanying realignment of Trunk Highway 371 has resulted in several traffic improvements. Contact: Carol Reamer, Mn/DOT, 651-296-1648 (email: carol.reamer@dot.state.mn.us). US 84/285 between Santa Fe and Espanola is the most heavily traveled roadway in northern New Mexico and a gateway to Santa Fe. To address safety and capacity concerns on the corridor, NMDOT designed and constructed a system of interchanges and frontage roads. The aesthetics of the corridor have also been enhanced by interchange artwork designed by local artists. Contact: Armando M. Armendariz, NMDOT, 505-827-5511 (email: armando.armendariz@state.nm.us). The Four Bears Bridge is the first precast concrete segmental bridge in North Dakota. An important aspect of the bridge design was the inclusion of many design elements that celebrate the history and heritage of the Three Affiliated Tribes of the Fort Berthold Indian Reservation. Contact: Terry Udland, NDDOT, 701-328-1969 (email: tudland@state.nd.us). The Noyo River Bridge on State Route 1 in the city of Fort Bragg replaced an existing steel bridge that was a landmark in the city. The new bridge minimizes obstruction of the ocean view and blends its architectural features with the site, providing an aesthetically pleasing appearance. Contact: Gudmund Setberg, Caltrans, 916-227-8282 (email: gudmund_setberg@dot.ca.gov). These two arch bridges carry Utah State Route 9 over the Virgin River. The original steel arch bridge, which opened to traffic in 1937, was renovated and strengthened and a new bridge was built that complements the original structure both visually and architecturally. As part of the widening of Interstate 5 north of San Diego, Caltrans designed and constructed a Plantable Geosynthetic Reinforced Wall. The wall blends into the surrounding environment with natural looking contours and provides planting space to sustain native vegetation. Contact: John Peterson, Caltrans, 916-227-8381 (email: john_e_peterson@dot.ca.gov). 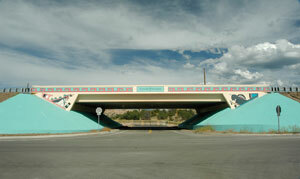 Artwork and design elements used in these three overpass bridges on I-40 resulted in visually appealing structures that welcome motorists to New Mexico, the "Land of Enchantment." Contact: Christina Romero, NMDOT, 505-454-3600 (email: christina.romero@state.nm.us). This project's goal was to improve the safety, flow, and traffic carrying capacity of US-89 from the Logan Canyon Summit to Garden City, while minimizing environmental disturbance. To lessen the impact from a proposed realignment, an alternate alignment that fit better into the natural surroundings was designed. The project team also worked to minimize impacts to a stand of mature forest known as the Cathedral of Trees. Contact: Randy Jefferies, UDOT, 801-620-1600. Six deteriorated stone parapet walls in the Towns of North Elba and Wilmington in upstate New York were replaced with a textured and stained concrete barrier that replicates the original walls, providing a natural-looking appearance that blends in with the surrounding environment. 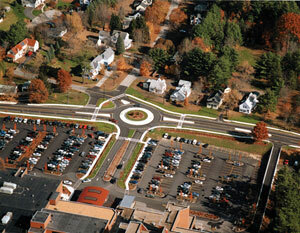 Contact: Robert Fitch, NYSDOT, 518-388-0232 (email: rfitch@dot.state.ny.us). Listed as a National Historic Landmark, the Laurel Street Bridge in Balboa Park was built for the 1915 Panama-California Exposition. After Caltrans determined that spalling concrete and other deterioration necessitated repairs, a consulting historical architect with experience in concrete restoration work was hired to provide guidance throughout the project. The restoration of the bridge ultimately improved safety while retaining the historic appearance of the structure. Contact: Bruce Lambert, Caltrans, 619-688-3313 (email: bruce.lambert@dot.ca.gov). This project restored Market Street, a historic streetscape in Christiansted in the U.S. Virgin Islands. Work included reconstructing the pavement with brick and cobblestone, preserving historic drainage infrastructure, and burying utilities in duct banks. Contact: Aloy Nielsen, Virgin Islands Department of Public Works, 340-773-1290, ext. 224 (email: anielsen@vitelcom.net). U.S. 180 in Breckenridge is one of the few remaining brick roadways located on the U.S. highway system. With partners ranging from TxDOT to the City of Breckenridge to the Texas Historical Commission, this rehabilitation project provided a much needed upgrade of the roadway while preserving the integrity of the antique brick street. Contact: Gary Ernest, City of Breckenridge, 254-559-8287 (email: gernest@bitstreet.com). Located high above Chautauqua Lake, the rest area offers travelers a panoramic view of the lake and the surrounding region. The building's design creates the illusion of a Victorian hotel, reflecting the architectural style of many of the structures found at the nearby Chautauqua Institute. Serving as gateways to the city of Des Moines, these three pedestrian bridges feature a distinctive blue color and graceful arched appearance, providing a safe and inviting environment for pedestrians. Contact: Nancy J. Richardson, Iowa DOT, 515-239-1111 (email: Nancy.Richardson@dot.iowa.gov). The Pennsylvania Turnpike has several stretches of roadway that are subject to severe fog. PTC's successful new Fog Warning System monitors conditions and provides early warnings to motorists using variable speed limit and dynamic message signs. Contact: Carl Defebo, PTC, 717-920-7176 (email: cdefebo@paturnpike.com). After a 2004 flash flood severely damaged California Highway 190 in Death Valley National Park, the road was reconstructed under an emergency contract. The result is a significantly improved highway that blends well with the park's remote terrain and includes design features that increase resistance to washouts during future flooding. Contact: Luis Elias, Caltrans, 760-872-5251 (email: luis_elias@dot.ca.gov). After 67 years, the 714-km (444-mi) Natchez Trace Parkway is now complete. The Parkway's aesthetic features include alignments and roadway slopes that follow the topography of the land and offer spectacular views of the landscape. Contact: Alan Teikari, FHWA, 703-404-6277 (email: alan.teikari@fhwa.dot.gov). The Kate Ireland Parkway was designed to enhance the beauty of the Red Hills Region of Southwest Georgia and North Florida, while addressing safety and drainage issues. Conservation efforts along the scenic corridor included removing invasive species and installing native vegetation. Contact: Steve Benak, FDOT, 850-638-0250. GDOT's proactive efforts to obtain public support for the 17th Street Bridge resulted in a fast track project that is a model of value engineering, innovation, and context sensitive design. Contact: Lillian Jackson, GDOT, 404-463-6451 (email: lillian.jackson@dot.state.ga.us). VQM is a formalized process that Mn/DOT integrates with the highway development process to achieve context sensitive solutions and resolve design issues that impact visual quality. Contact: Scott Bradley, Mn/DOT, 651-284-3758 (email: Scott.Bradley@dot.state.mn.us). Effective project management, partnering, and innovative contracting all played important roles in reconstructing Pennsylvania Avenue in front of the White House as an attractive landscaped space closed to traffic. Contact: Michelle Pourciau, DDOT, 202-671-2800 (email: michelle.pourciau@dc.gov).